In September 2016 we revisited Runo Primary School, one of the most under-resourced schools in the area, set amidst some of the most stunning scenery in West Pokot. There, as on previous visits, we discovered that the Nursery Class of up to sixty children is still being taught in a tiny former gatehouse. These children were let out to sing and play with Yellowmen Wendy and Chris and were then invited to give us their own concert. For me, this concert was the highlight of my seventh visit to Pokot. It will come as no surprise that Kenyans are naturally gifted musicians, using the voice as their principal instrument. I have observed that there is a usually what we would describe as a cantor and then everyone else joins in with instinctive harmonies which most of us are only able to produce in our dreams. Imagine then, my utter delight when a little girl aged no more than three or four, wearing her school jumper on her head (presumably to protect her from the sun) and a uniform from a different school, took on the role of cantor for two songs which would have made many an opera singer envious. 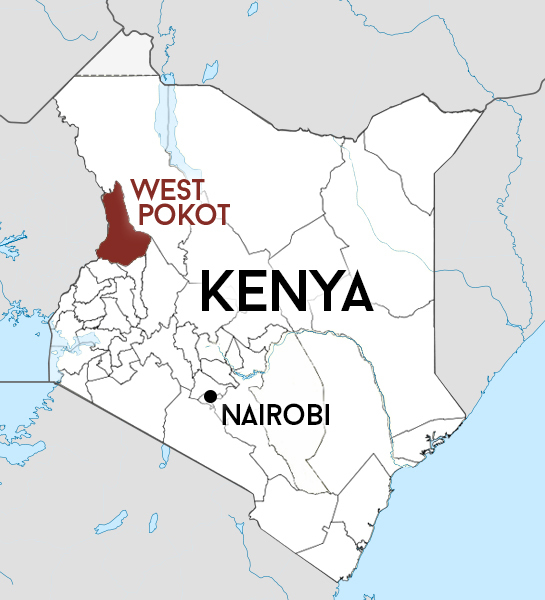 It transpired that she was not actually Pokot, but a member of the Luo tribe and that her first song was in praise of Jesus and her second song was about the need for young people to make wise decisions about their futures. Surely there are lessons here for us all. She was completely uninhibited and allowed me to photograph her at close quarters, not only while she was singing but also while Father Pat was thanking her in the customary way for her wonderful efforts. Reluctantly I shall now leave Runo and move on to the Hastings Half Marathon, 2017. This is absolutely the last time I shall make any pretence of running round the route and frankly, I am dreading it. Fortunately we have a team of six runners and walkers, composed of three serving Yellowmen, all of whom visited West Pokot in February, and three stalwart friends, two of whom have already gained their honorary Yellowmen shirts for participating in last year’s half marathon. The reason I mentioned the cramped teaching conditions for Runo’s Nursery Class is that we are currently piloting a new building method, which could provide affordable and sustainable buildings for general use. One of our projects last September was to begin building a new classroom for the Nursery Department at Marich Pass Primary School. The teacher, Fridah, has in the past been obliged to teach in the open air, but currently she and the children occupy a classroom which has a wooden framework and which is about to collapse due to infestation by termites. The classroom we are building is innovative because it has a steel framework with steel meshing. It will not collapse and the mud can be replaced easily when required. This type of building is quicker to assemble than a brick building, is strong and long-lasting, is relatively cheap, and is flexible in terms of size. In the longer term, we have aspirations to set up a local mini-factory where steel frames of any size could be pre-fabricated. The structures so produced would be extremely versatile and could be used to build classrooms, dormitories, clinics, houses, offices and so on in any shape or size, while providing employment for the hard-pressed local community. The Hastings Half Marathon 2017 takes place on 19 March. You will have gathered that our focus is this exciting new building project. Please support us if you can and make my final HHM effort something to remember!